Designed to carry and store nebulizers. Universal size can accommodate all Drive nebulizers. 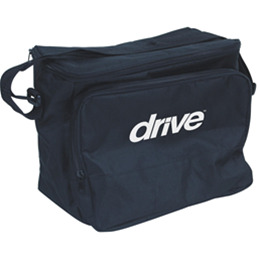 Made of durable, lightweight, easy-to-clean nylon. Comes with an adjustable carry strap. Has a zippered cover and zippered pouch to conceal nebulizer accessories. Size: 9” (H) x 12” (W) x 7” (D).